Laos is a country that is steeped in tradition, especially when it comes to food and music. 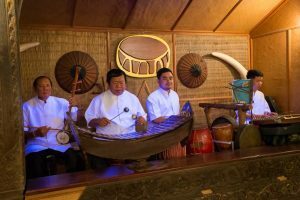 And on any given night of the week, diners can enjoy an authentic Lao meal while elaborately dressed dancers perform to the strains of a traditional khene and percussion ensemble. 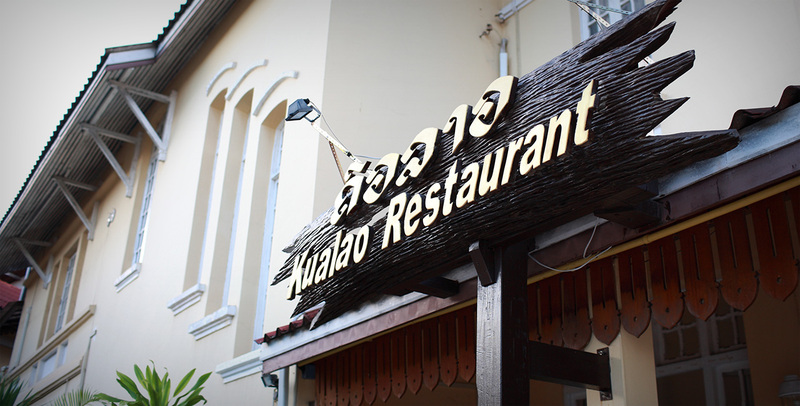 It’s a regular offering at Kualao, the popular Vientiane institution that has been serving up the best of Lao cuisine for decades. For many travellers, it’s the breathtaking natural beauty and World Heritage sites that have brought them to the country, but the country’s distinct legacy in the performing arts is the soul of its people. 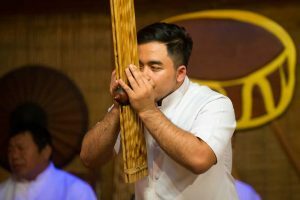 At Kualao, tourists and locals alike can delight in cultural experiences that are becoming scarce in the developing world. Like a living folklore museum, lovers of live music and dance can explore authentic Lao traditional dishes at this charming French colonial home near the Mekong River, where some of the country’s foremost classical musicians and dancers entertain audiences with nightly stage shows reflecting their rich history and ethnic heritage. Bounchanh Bouphakham, who left Luang Prabang in 1966, leads the band. 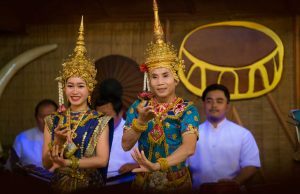 More than 500 classical music teachers across Laos and America who now carry the tradition for their people learned from him as one of the last performers to have played before the royal court. Born to a farming family, Bouphakham taught himself to play music – against his parents’ wishes – through observing some village elders play when he was just a young boy. “My favorite song is ‘Oh Duang Champa’ sometimes called ‘Champa Meuanglao’,” he says. The Lao are renowned for their love of singing music together that portrays the joys and hardships of rural life, love stories and even folk tales about animistic spirituality. Improvised lyrics can suit the artist or event, although the Lao all know the famous ones by heart. Songs from Cambodia, Thailand, and Laos have common roots with differences in tempo and lyrical content. The khene, a bamboo mouth organ unique to Laos, can also be found in much of its iconography. 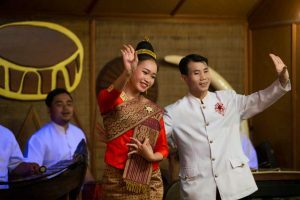 Dance is also an integral part of Lao culture, and Suang, the lead dancer in Kualao’s nightly shows, has been performing since the restaurant opened 20 years ago. “Entertaining people has always been my great joy in life,” he says. His story is one of triumph over social norms that viewed dance as a female medium. Times have changed and his performances are cherished by audiences from around the world. Inside the restaurant, the rattan walls are typical of villages in Lao – a fusion of both the traditional and colonial periods with family portraits and heirlooms providing a welcoming personable atmosphere. Mee, the service manager, delights in helping guests find what they’re looking for – a comforting meal, or a new experience. Among Kualao’s specialties, guests can enjoy purple sticky rice with dishes from around the country, including staples such as Laap and tam mak hoong, as well as the more exotic Or Laam from Luang Prabang, or the legendary matsutake mushrooms of Xieng Khouang.